The creator discusses working as an illustrator on archeological digs, co-editing a new issue of ‘The Strumpet,’ upcoming projects and more. 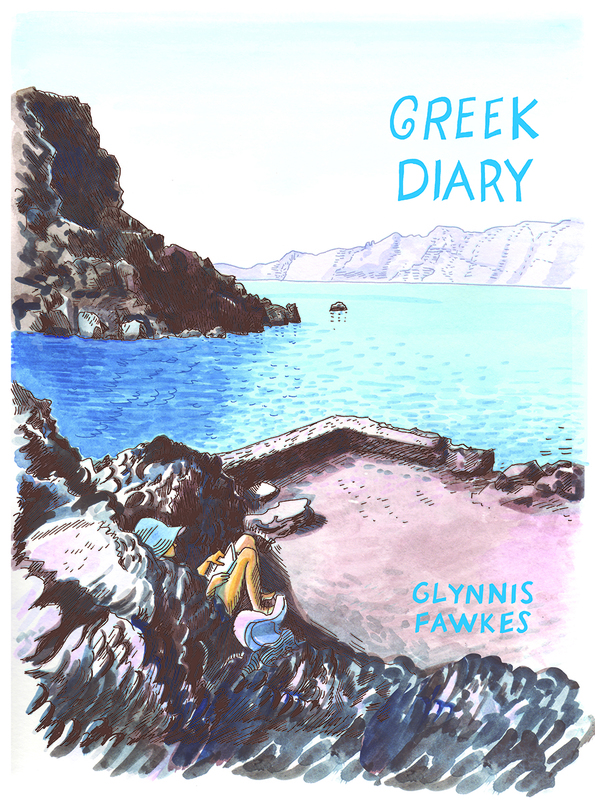 Earlier this year Glynnis Fawkes published Greek Diary, a collection of comics about the previous summer that was spent working on an archeological dig in Greece and a trip through the Greek islands. Fawkes has been working since art school as an illustrator for archeological digs, and has illustrated a number of scholarly books including Three Stones Make a Wall by Eric Cline and Kinyras: The Divine Lyre by her husband John Curtis Franklin. This interest can be seen in a lot of Fawkes’ comics work like Corinthian Diary, Time Out in Palestine and Alle Ego, which was given a MoCCA Art Festival Award of Excellence in 2016. When it debuted at this year’s MoCCA Arts Festival, Greek Diary received the Silver Medal for Long Form Work. 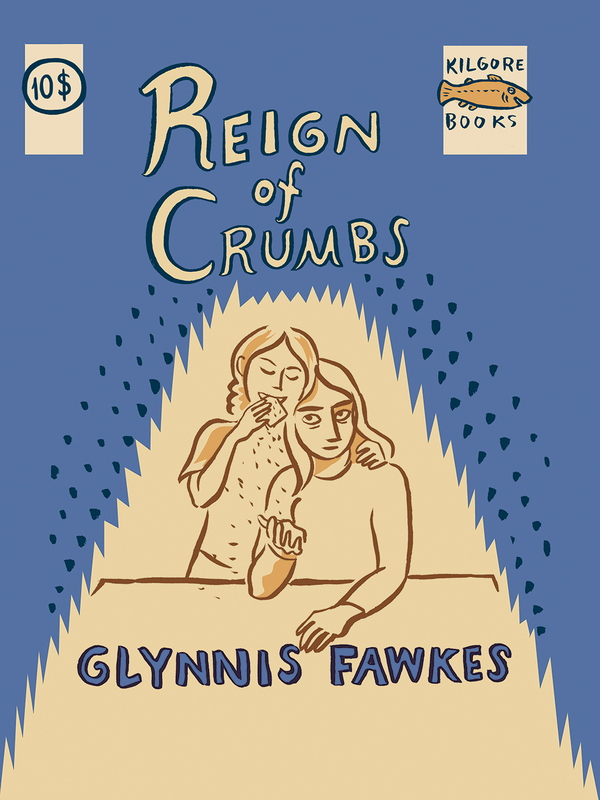 This year also saw the release of Reign of Crumbs from Kilgore Books, which collects many of Fawkes’ diary comics that have appeared in Mutha Magazine, The New Yorker.com and elsewhere. Fawkes has also been in both of issues of Resist!, and is co-editing and contributing to the new issue of The Strumpet coming out this fall. Fawkes will be at the Small Press Expo, or SPX, this weekend in Bethesda, Maryland. You can find her at SPX table I7B and will have copies of Cinderbunny and the “spanking new” Strumpet 5, as well as Reign of Crumbs and Greek Diary. Fawkes and I spoke after she returned from this year’s trip to Greece. Talk a little about Greek Diary. You go to Greece most summers to work on an archeological dig while your husband and the kids stay at home and last year they came to Greece and you were tourists for a bit, and this is your diary of that time. I did it to keep sane while I was there. Besides just documenting daily life, because it started before they came when I was just working on the archaeological project, when you’re away from home it seems for me everything is heightened and you notice much more. Things are not exotic, but just different enough to be interesting. Then I realized I had some momentum and I felt like I needed to do this every day and several times a day. Especially after my family came it was really something to keep me sane. I don’t want these comics to only be about complaining about the kids. 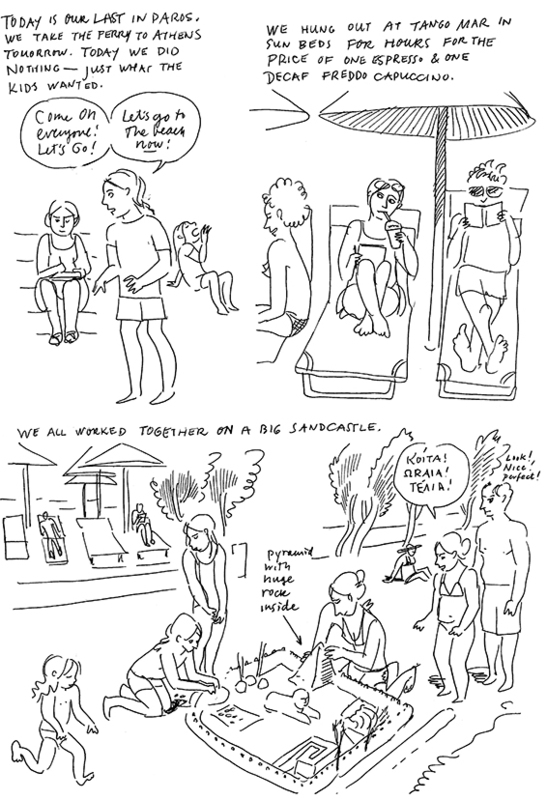 I didn’t draw comics as obsessively this year when I went to Greece – I went for two weeks in June – or Cyprus, where we spent the month of July all together. I drew some but I didn’t want to do the same thing again. I didn’t have the time because we were also working on a film. I had three notebooks full when I came back last year. I thought, okay, I’ll take the next week when the kids are at camp and fix up some stuff and scan the whole thing and then I’ll be done. Last year by SPX I had a scanned draft and I made five copies and showed them to some people. My friend Summer said, “This has a lot of potential but it’s not there yet. I want some context. What are doing there and why do you do this?” I knew she was right, so I went back and spent the rest of the year adding to it. I also did some other projects; I illustrated a book for Princeton and kept drawing other comics, but it took until January-February of continual editing to make this book. I think I added about a hundred pages of context or extra drawings and the section in the middle from the past that was a flashback to before the kids. It turned into a bigger project than I anticipated. It isn’t a book I meant to produce. It was both by accident of being there and wanting to capture moments, and also have a refuge in drawing. Then I felt like it’s a chance to put the whole thing in context and tell a bigger story. 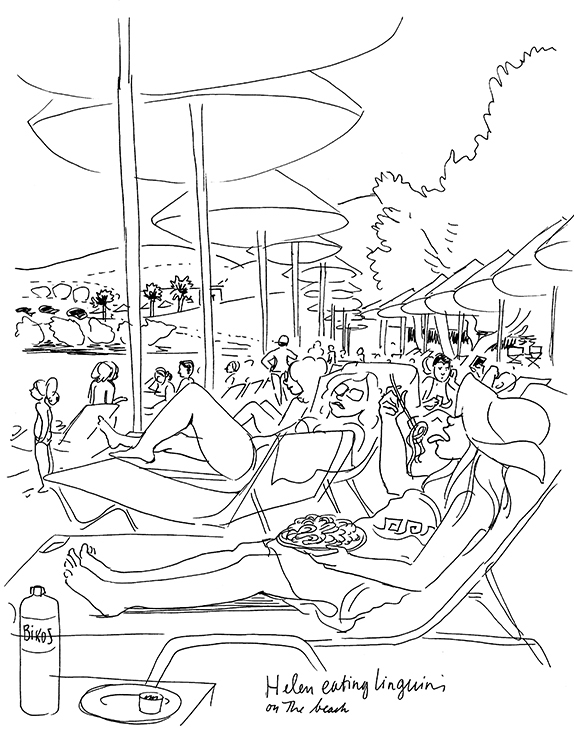 My life goal is to make a book about the several years I spent working as an illustrator on different sites around the Mediterranean before I had kids and met John, and how I met John, and various dig romances. That’s my goal, but I haven’t gotten to it yet. What was the book you intended to make? I knew about half-way through the trip that I wanted to make this into a book that hinted at more of a story than the daily life of the trip. I intended Really just make diary comics – and then it turned into this book that looks back at the past to how John and I met—with some wonder at how we got to where we are now. At some point I knew this could make a book, but I thought it would be a much smaller book. It kept growing. So every summer you work as an illustrator on archeological digs. What exactly does it entail and how did you get started doing this? I was in art school, and I realized that I could go on a dig for one of my academic credits. I did, and I didn’t love the digging part because it was really hot and dusty, so I asked if there were things that I could draw. The professor whose project it was said a project always needs artists, so I just started drawing small things they needed like architectural blocks. That was fun and changed everything. The reason archeologists need things drawn and not just photographed is there’s often details in the objects that drawing really brings out. The thing that I’ve drawn most is pottery. Even with a fragment of a rim of a cup you can tell the diameter and you can tell the stance, and those are the kind of things that archeologists use to date the pottery. How wide a vessel is or what angle the rim is plus the decoration allows archaeologists to determine a relative date of the pottery. Every piece of pottery that says something about itself and its context has to be catalogued and drawn – as well as photographed. So there are thousands and thousands of pieces of pottery that might never appear in a museum that are probably in crates in store rooms somewhere that are drawn and published so that other people can look at the publication and say, “We have this too at our site, but ours are later or earlier or from somewhere else.” Archaeologists must publish their finds in order to create a network of information that’s shared between all people studying archaeology across the Mediterranean. So you were in art school; you weren’t studying archeology or the classics? People might know your comics, but in working on the dig or illustrating academic books, you work in a very different style. For sure. Definitely not creative. You mention in the book your frustration in working on these drawings in a classic illustrative style, and you’re supposed to put as little of your personality in the drawing as possible. Your comics have a much looser style, which in some ways feels like a response to having to work in this illustrative style. That, and that time was so limited. I feel like I had to draw what I could when I could. I just came across a whole bunch of drawings that I did when I was in Cyprus 18 years ago. I lived there for three years, and they’re much more detailed. 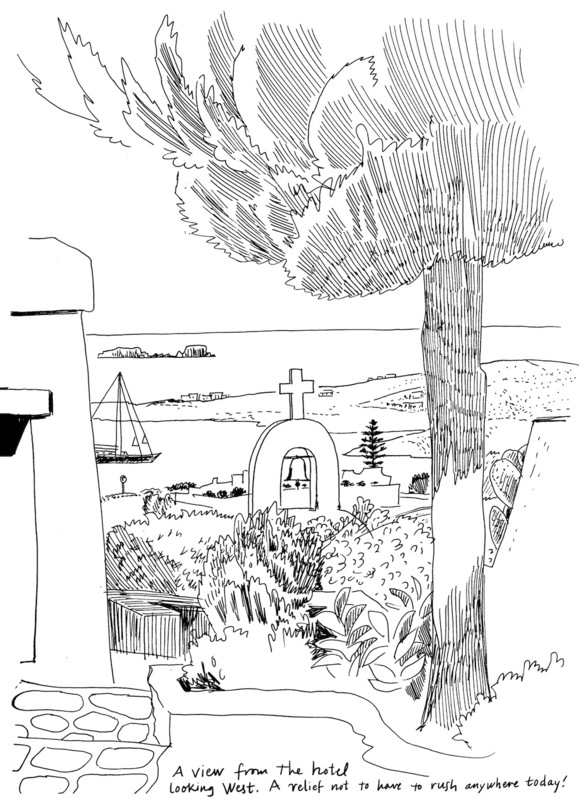 I published a book of cartoons there, but I also did a lot of playful drawings about the artifacts and landscape, and they’re much more detailed than what I’m doing now. [laughs] I was mad. I’m losing it, man! But now it’s really just wanting to draw as much as I can get down while I can. I hope that with my next projects I can refine the style a little bit more. Not make it so scrappy. When I describe my work like that to people and they say, “Shut up. Don’t say that about yourself.” But I know there are different levels of attention you can give an image, and I’m ready for some more. The main thing I’m worried about is losing spontaneity if it’s too planned out. Last year I started Alle Ego, which is much more plotted out and seems stiff to me in places – or the whole thing, comparatively. I’d really like to finish it because it’s a chapter in a bigger book that I’ve drawn, but I haven’t inked yet. I have some other stuff in the way. I have a project to do this year with the Center for Cartoon Studies biography series. I’m going to do a biography on the Brontë sisters. That’s something completely different. For Greek Diary you have this flashback section about how you and John first met, which you did on rice paper with ink wash. Did you make these last year for the book? No, I did those in 2003. I’ve had them, and when I started drawing the story of those days in Santorini in the same style as the rest of the book, I realized I’ve already drawn all these same scenes a long time ago. So I dragged them out and then had to put some text with them because otherwise you can’t tell what’s going on. I thought instead of redrawing the whole thing, to use these as a voice from the past. You may have written the text last year, but it reads as though it could have been written years ago. There’s no foreshadowing or references to the later work; it’s an interruption that gives context to the rest of the book. I feel like in the past couple years since we met you’ve gotten very busy. Reign of Crumbs is out from Kilgore Books, which collects a lot of the comics you do for Mutha Magazine and elsewhere. You’re in the Ladybroad Ledger. What is that? That is the dream made reality of Stephanie Zuppo, who’s such an excellent organizer of things. She’s amazing. It is especially for Vermont. She asked me to do that cover, which was fun, and the most recent issue I collaborated with Helen my daughter on bunny comics, which is also really fun. As much as Helen has a mad face in so many of my comics, her drawings are so just good. She would say we never draw enough together, and that’s probably true, but we spent Spring Break working on these together and it was really fun. Now we’re working on those same bunny characters but telling fairy tales. We’ve only done one so far – well, half of one – Cinderbunny. It’s fun to work with her. She’s ahead of me right now. She’s done all the inking and started to color it. She wants me to letter it but she’s drawn all the balloon shapes already. I said, no, don’t draw those until I letter it. So it’s an education all around. You also drew comics for both issues of Resist. You’re also co-editing the new issue of The Strumpet. Ellen just sent me the final pdf today. It looks great. I did a seven-page comic about my mother’s Alzheimer’s and growing up with artist parents in Portland, Oregon. Ellen and Jennifer Hayden also contributed, and it’s an interesting mix. I really wanted to do a project with Ellen because I think the issues of The Strumpet she’s done before have been great in that they encouraged me to draw to themes that I never would have otherwise—and it’s true again for this issue. She has done way more work on this than I have. I mean, we came up with a theme, “Origins,” together, and we talked over every piece, but she’s done all the layout and she wrote the introduction letter about how we chose the theme before the election and how things have changed so much in the world since last November. I wanted to work with Ellen to see how an anthology like this comes together. I think the theme of “Origins” is interesting at this time. The idea came before the election and I already had the idea of what I wanted to draw, my parents and coming from Portland, and so I wasn’t talking about our political situation exactly, but Ellen’s does. [laughs] It’s a not uncommon question. I taught a class about it at [The University of Vermont] and I’ve taught workshops. This is a tricky question also because often people who are running a dig don’t want people who can’t already do this job. It takes a bit of training to know how to draw objects and pottery. The way I did it was when I knew I was going to Cyprus on a Fulbright I got a list of all the email addresses of excavators on the island and wrote them all a letter saying, I can illustrate, will you hire me? I had worked one season on a dig in grad school in Israel where I learned to make measured to-scale drawings. I really didn’t know what I was doing, so I learned on the job with several very patient projects who did not have me drawing pottery at the beginning because that’s the hardest thing. I drew stuff like stone tools, grinding stones, those pipes that attach to copper smelting kilns. I think the best way to get this kind of job is to go on a dig that has an illustrator working on it and get close to that person and get some training. Before I worked at Troy, I had an official three-day training session with one of their illustrators on how to draw – the Trojan way! Apprenticeship is the way a lot of other illustrators I know have started. Although there aren’t that many illustrators. With 3-D scanners it’s getting more that people want to scan pottery and then computers will spit out images, but some people say they don’t look the same, or are as readable as hand-drawn pottery. I don’t know. So many things. One of my goals is to finish Alle Ego. I have in mind a second book. Alle Ego is about the first trip to Greece and some of it is about having this disastrous art school affair so the two chapters that go before and after the part that’s Alle Ego are all about that. Then a second book I have in mind would be all about living in Cyprus and working on different excavations all around the Eastern Mediterranean. That’s my life goal. Meanwhile I have this Brontë book that will take this year. I’ve also proposed a crazy middle-grade adventure comic that takes place in the late Bronze Age after the eruption of Santorini. I have a pending contract for that. And yet another book in the future is Homeric Hymns in Comics. I drew comics for the Hymns to Dionysus and Aphrodite as one of my first experiments in making comics with panels. I’ve illustrated two books for Princeton Press and worked closely with this really nice editor, so this year John and I proposed a book of new translations of Homeric Hymns in comics form, which he wants. Summer has given me a talking to about prioritizing my own work, but it’s all interesting and it’s all fun; I just need more hours in the day.